I have been trying to avoid this topic for a very long time now due to the controversy and disturbances it is going to generate. Like Igbo people would say “agahi ekwe mgbagbu ghara ogu (not because people would be shot that would make us not fight for a just course). The Igbo spirituality is one that has suffered a great deal of unjust treatment from both the Western civilization and the Christian faith, and recently, from Igbo religious fanatics. Many things about the Igbo Spirituality have been misconstrued either out of mischief or out of sheer ignorance. This article is meant to throw some light on some of them. There are also some parts of Igbo Spirituality that have been adulterated. I believe those who did this started it as a form of modernization or maybe a hangover from their religious indoctrination. The Use of Candle and other religious materials. Like I said earlier, the Igbo Spirituality has suffered a great deal of persecution both from dissenting Igbo people and those who have shown religious fanaticism. Before the introduction of the Christian religion to the Igbo people, the concept of the Creator God was already being altered. The concept of the Creator God among the Igbo people was hugely clan-based (I have already talked about the diversity and the decentralization of Igbo people and their leadership in a previous article “The Slave That Is His Own Master – The Igbo Story”). For instance, some called the Creator God Obasi, others called it Chineke, others called it Chi Okike, others called it Olisa, and so on. However, the Chi Okike Abiama is an Aro version of Creator God. Aro people were warriors. They started a religion with their Chi Okike Abiama at its centre. They started a war against their neighbours and other Igbo clans in a bid to colonize, control, and convert them to their religion. Just like the Jews, they believe that Chi Okike Abiama made them some special people. Every clan they conquered, they would impose Chi Okike Abiama on them as the Creator God. Being that they had already touched several parts of Igbo territories, the Chi Okike Abiama was already known as the Creator God by most Igbo clans while the few clans left to have identified with this Chi Okike Abiama were either still at war with the Aro warriors, or they have fended off the Aro warriors from their clan, or they are yet to be visited by the Aro warriors. READ: The Jews Of West Africa - Are Igbo People Jews? Unfortunately, this Aro Chi Okike Abiama religious movement was short lived. The Europeans invaded Igbo territories less than 150 years into this colonial incursion of Aro people and ended the spread of this Chi Okike Abiama religion. The Christian missionaries, in a bid to convince the converts of these Aro people and their conquered territories without much more resistance, they coined the phrase Chiukwu Okike Abiama. This they told the people that they have brought the same Chi Okike Abiama to them but that they have been following it wrongly, that the real name is Chiukwu, which means, the bigger Chi among all Chis. Note that Igbo people identify with Chi as a personal god. Every person had a direct relationship with their Chi. Chi is more like your guardian angel while Chi Okike Abiama is the Creator God. With the increasing influence of Christian faith among Igbo people and the adoption of Chiukwu Okike Abiama as the Igbo version of Jehovah Yahweh, many Igbo people started buying into Chiukwu. The trick employed by the Europeans was to give us the impression that they have not come take away our Chi Okike Abiama but to tell us what we didn’t know about Chi Okike Abiama and how to worship it. Over time, Chiukwu Okike Abiama became simply known as Chukwu. In the Igbo spirituality, aside from being faced with increasing persecution from Igbo Christian fanatics, Ekwensu is the most persecuted of all the Igbo deities. In the Igbo Spirituality, there is nothing like a spirit or a god that punishes people after death, instead, it is about Ancestors rejecting the spirit of their kinsman. In fact, the punishment of evildoers was by the Ani deity, that is the God of the Land. Ekwensu is a deity in Igbo spirituality for Trickster, gamble, and violence. When you want to bet, you are most likely going to make offerings to Ekwensu to help you bet rightly. As a magician, it is Ekwensu that you should call upon to direct your magical powers. And because of Ekwensu’s violent nature, Ekwensu is called upon by warriors in times of war to help them surpass their enemies’ violence. You may be interested in reading my work on Amadioha. 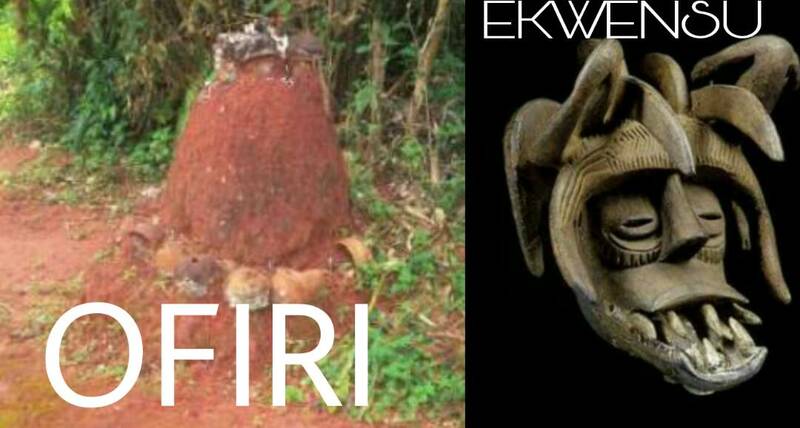 In the Nkanu region, Enugu State, there is what is called Ony’iji Ekwensu. This is more like the prophet or priest of Ekwensu. The characteristics of Ekwensu do not agree with the characteristics of Satan as written in the Bible. There was no time in Igbo Spirituality that Ekwensu rebelled against the Creator God. There is no connection whatsoever. I will agree that Ekwnesu was not known by all the Igbo clans but those that revered Ekwensu before the European invasion never saw Ekwensu as a devil or the king of Some demons. In fact, there is no place for Satan in Igbo spirituality. So Satan is Satan while Ekwensu is Ekwensu and never Satan. Have you noticed that some dibia and practitioners of Igbo traditional belief now use candles. Maybe the use of candle by these people is for illumination but I started having serious doubt when I started seeing colored candles, each used for a specific spiritual purpose. Again, this is another borrowed ritual from foreign religions. For instance, a former Sabbatarian that turned dibia is most likely going to add some of his knowledge of Sabbath’s rituals to his traditional practice. Of course, I am an advocate of inter borrowing of cultures, traditions, and beliefs, but I am against replacing an original culture with the borrowed without any reference or claiming that a borrowed culture is the original. Some of the users of these candles, cross and other religious materials claim that these items are crucial to our spirituality but have been symbolized with something different. This claim is false. The Igbo people worshiped the Sun God, (Anyanwu). There is no need of a light to worship the light. The use of candle was introduced by religion. The religious belief that the centre of the religion, that is, the central figure of that religion is light, made them use candles to signify light, that is the central figure of that religion. For instance, Christians believe that Jesus Christ is the light of the world, and so, they light a candle which Jesus represents to dispel darkness. In Igbo Spirituality, the Sun itself is worshipped, there is nothing to represent the Sun except the Sun itself. So those who burn candle in a dibia’s house are doing so as a borrowed tradition not as a core of Igbo spirituality. I am not going to condemn nor approve of their action but it is pertinent to say that such practice is imported or borrowed and not core to our spirituality. I am going to address the issue of demons and other Igbo deities in the Volume two of this topic. I hope this is informative to you. Have a nice day.